The new book I just finished, The 4% Universe by Richard Panek, had a mind-blowing fact. This is the Hubble Deep Field image. In 1995, for 10 days the Hubble Space Telescope focused on a single spot of sky. The spot was the size of a grain of sand held at arm’s length. In case you haven’t held any sand lately, that’s really, really small. The 10 days of light collection resulted in an image. The image showed galaxies. Lots of galaxies. Around 3,000 galaxies, each with 100 billion stars, give or take a few billion. 3,000 galaxies in a grain of sand. That number staggers me. But there’s more than that. There’s nothing unique about what Hubble did. That light isn’t limited to the HST. It is here. Now. Bathing the Earth, as it has for all the billions of years our planet has been here. 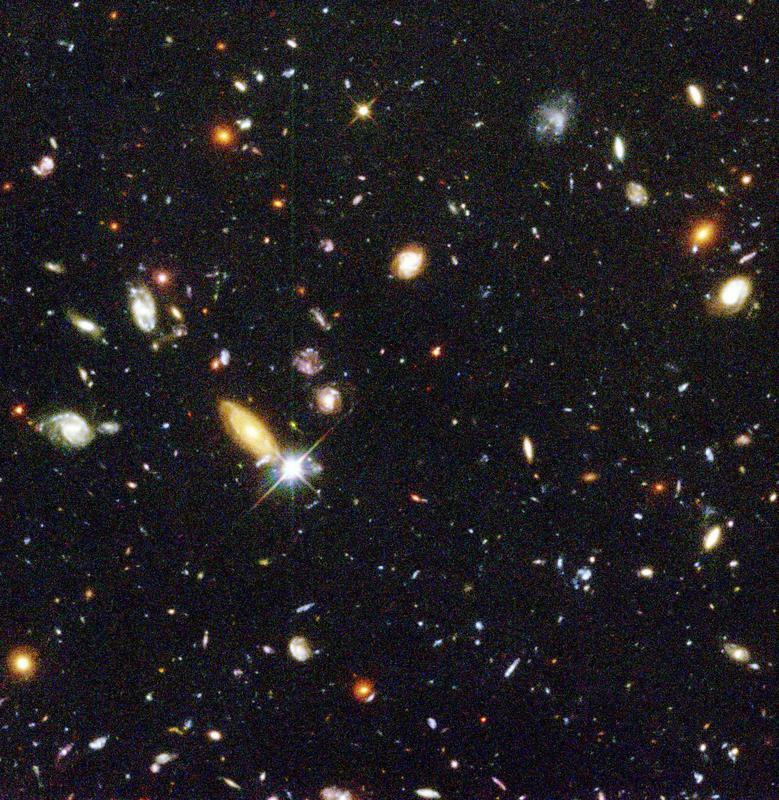 Every time you look up at the sky, you are capturing pieces of light from more galaxies than you could ever count, 3,000 in every sand-grain-sized spot. All those photons are always there, day or night, raining down on us. Some of those pieces of light are 10 billion years old. That means they left a star (almost certainly now long-dead) billions of years before the Earth even formed. During that photon’s travels, the Earth coalesced, life evolved, intelligence arose, and you happened to turn your head to just the right spot to catch that photon in your eye, while billions of others landed instead on your head or in your eyebrow, or missed you entirely. All those galaxies, whispering to us across time and space, and most of them we will never hear, never see, never know. But that picture above, a picture that none but our generation could ever have seen, gives us at least a little glimpse of just how unfathomably big this universe really is.